All varieties of apatite are energising without creating anxiety or hyperactivity, so the user can remain calm while still feeling more motivated and alert. Blue and yellow are especially uplifting, making them good anti-depressants, and useful in clearing general irritability, unexpressed anger, and ‘the blues’ (as opposed to actual depression), so the best of us emerges to the surface. It stimulates the flow of energy through the physical and energetic bodies, and balances throughout. Apatite ignites the spark of new ideas, creativity and spiritual/self development. Some healers use it to stimulate clairvoyance, and bring forth insights from past life. Physically, it can strengthen teeth, and aid bone healing and calcium absorption, making it helpful in cases of osteoporosis. Some books suggest it can be used to support weight loss and healthy eating habits (could it be the name?). As it is a balancer, it may in fact be useful for this. Blue apatite is strongly mood-lifting and balancing, and is very helpful when worn in situations of stress, as it brings a balanced calm without diminishing motivation. It facilitates general communication, and, similar to amazonite, gives us confidence in self-expression, especially in a leadership capacity. This can also be on a higher or deeper level, assisting communication with guides or Spirit, and stimulating self-reflection. 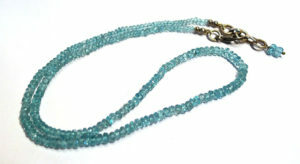 Aqua blue apatite comes primarily from Russia. It is more translucent than teal blue apatite and is frequently mistaken for aquamarine. There is a lot of jewellery currently being marketed as blue apatite, which has strong cleavage lines and fades in sunlight, meaning it is more likely to be blue-green fluorite (apatite does not display perfect cleavage and does not fade in sunlight). The qualities are similar to its teal blue cousin, but lighter and more refined. A long thin crystal held vertically in front of the body helps to align and centre energy, and will calm and balance, especially when thoughts and emotions are disjointed, or energy is not flowing. Apatite is a general name for a number of related phosphate minerals, all of which are structurally identical calcium phosphates. The most common and best known is fluorapatite, which contains fluorine; most of the gem grade apatite we use in healing is fluorapatite. Hydroxylapatite contains a hydroxyl (OH), and chlorapatite contains chlorine. Fluorapatite is an important source of phosphorous, used in making matches, amongst other things. Chlorapatite is relatively rare. Apatite occurs as an accessory mineral with many igneous rocks (most gem grade material comes from this source), but is also found in bedded marine deposits. Apatite colours most commonly associated with crystal therapy are blue (teal) and yellow (gold). Yellow crystals are small, and therefore never tumbled, while the blue is commonly available as a tumble stone, and less frequently available as individual crystals or massive pieces. At one time, blue apatite was carved into spheres and palm stones, but these are rare now. Gem grade pieces can be faceted, and make lovely jewellery, but are a bit soft for wear. From the Greek απατείν (apatein), “to deceive” or “to be misleading”, as apatite was often confused with other minerals (beryl, for example – pale blue apatite bears a close resemblance to aquamarine). 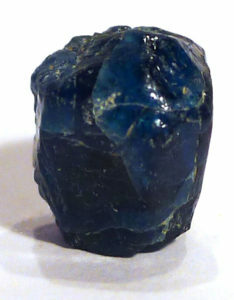 Apatite was renamed fluorapatite in 1860 from the original apatite of Abraham Werner by Carl F. Rammelsberg, to emphasize the chemical composition. As its recognition is relatively recent, there are no historical traditions associated with apatite.